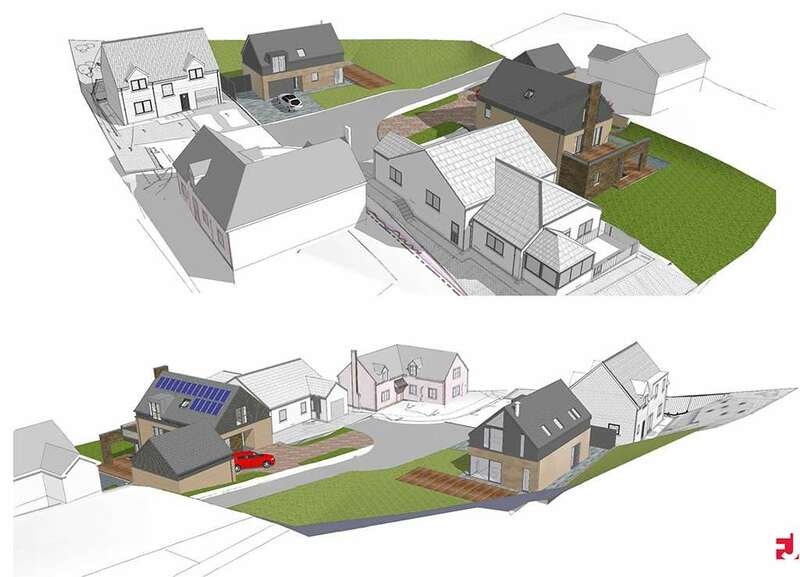 The proposal sought permission to erect a new 3 bedroom house in an established residential area of Jedburgh. The site is located in a suburban setting in Dounehill on the eastern edge of Jedburgh. Currently there are no other buildings or structures which occupy the site, however more recently there has been construction work to erect new dwellings of a slightly larger scale on the neighbouring and adjacent plots. The elevations have been carefully considered, so not to replicate but to compliment the appearance of the neighbouring buildings. The principal façade materials are to be a combination of stone and off-white render with grey composite windows and composite grey cladding. The stone and render will ensure a visual connection between the proposed buildings and its neighbours, the combination of all the materials will provide texture and relief to the elevations of the buildings. The grey composite cladding has been restricted to the upper storey only. The dark material will minimise the visual presence of the half storey, ensuring the mass and bulk of the building remains sympathetic to its surroundings. The chosen façade materials are robust and will thereby ensure the proposed development retains its appearance over time with a minimum amount of maintenance. The approach to the choice of external façade materials is commensurate with the simple contemporary building form which combines to create a cohesive and sustainable design that avoids the trappings of a more conventional ‘pastiche’ design solution.